Ecouterre is the official media sponsor of DIY With IOU. 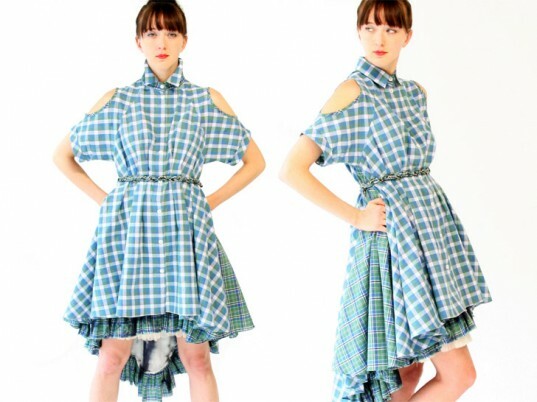 Learn more at Source4Styleabout the search for the IOU Project’s next ethical designer! And they're off! The 10 finalists of the IOU Project and Source4Style's "DIY with IOU" competition have spent the past two weeks documenting and creating beautiful garments from 8 meters of handwoven cotton madras. The winning design will go into production in New York City's Garment Center as part of IOU's "Made in NYC" Spring/Summer 2013 capsule collection. Once produced, the piece will be featured at a trunk show at ABC Carpet & Home and sold on Fab.com. Although final decisions on the winning piece will be made by Kavita Parmar, design director of the IOU Project, Ecouterre readers have the opportunity to vote for their favorite design. The crowd favorite will receive a $50 swatch certificate for Source4Style and bragging rights in perpetuity. You may vote once every day until 12 midnight ET on Sunday, April 1. We'll announce the winner on Monday, April 2. “My intention with this dress was to transform the traditionally unisex cotton madras into a piece of timeless elegance. My criteria for timeless design is that which elicits an emotional appeal from women of all generations. “Doing a zero-waste collection with madras was a fun challenge. Each pattern piece needed to line up precisely. This typically means a lot of waste. To counter that waste, I created a collection of traditional pieces and their ‘shadows,’ using the leftover scrap from the negative space to create additional garments. “In this design I let the material speak to me, as it is the key element in the IOU Project’s line. Madras is reversible, so taking it to the next level I wanted a garment with multiple uses that would inherently be sustainable without saying a word. “My piece was initially inspired by Mr. S. Murugave’s construction of the weave. The weight of the resulting raw fabric holds shape well and lent itself to a more structured design. Therefore, I wanted to create a flattering, tailored garment. To achieve this, I shaped the fabric to closely fit the body and employed a collar and lapel neckline. In order for it to be well-fitting, I played with many different arrangements of darts, eventuating in creating panels to have a tidier finish. “A flattering look, for tall, short, curvy, and skinny women alike, is a fitted bodice and full skirt. 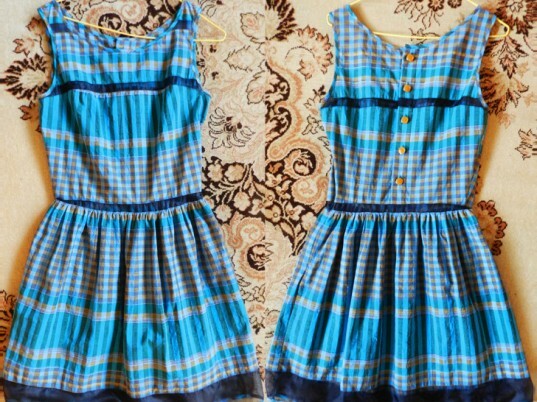 Very little says summer more than madras cotton, so I set out to make light and feminine dresses which could transition from a picnic in the park in flip-flops to dinner in colorful strappy heels. Originally published on March 28, 2012. Love the simplicity as in the lines of this dress, even though there is a lot of detail . such beautiful designs from all contestants. I have my favourites based on the colors/weave structure and favourites based on the design itself. but you have all done an outstanding job - congratulations! They are all so well done, but I think Lara Miller did the all around best job. She chose a silhouette and function that would look best with the fabric and pattern, which helped tremendously with the overall appeal of the garment. Nice job. 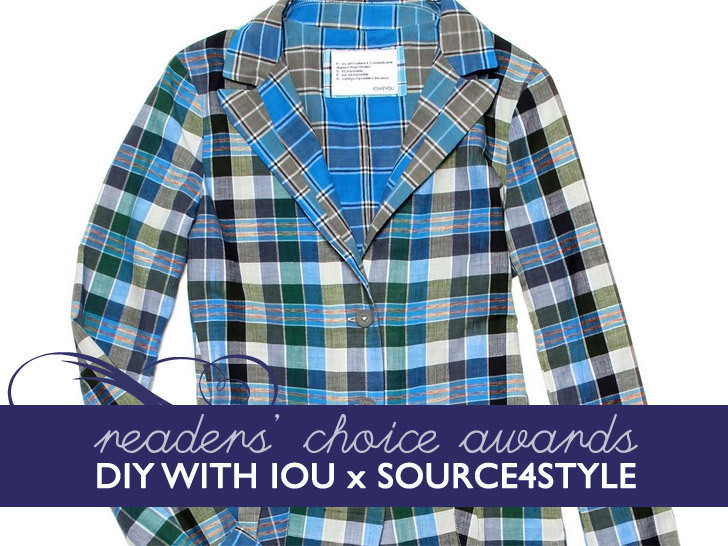 LAST DAY to Vote for Your Favorite �DIY With IOU� Finalist! "My intention with this dress was to transform the traditionally unisex cotton madras into a piece of timeless elegance. My criteria for timeless design is that which elicits an emotional appeal from women of all generations. "As a designer my first priority is how my client feels in what she is wearing, the full bias cut of the skirt allows for ease and mobility. The wrap detail on the slit sleeves resulted from the desire for some coverage on the arm but also ventilation essential for a summer day-to-evening party dress." "Doing a zero-waste collection with madras was a fun challenge. Each pattern piece needed to line up precisely. This typically means a lot of waste. To counter that waste, I created a collection of traditional pieces and their 'shadows,' using the leftover scrap from the negative space to create additional garments. "To be sure every last bit of the fabric was put to use, I cut off the selvage and knotted all of the tiny leftover scraps together, then knit the scrap 'yarn' on my hand—no needles required, just yarn and your two hands—which felt like the perfect way to pay respect for all of the beautiful handwork that’s done to weave the IOU project’s fabric. The pieces, which I lined with black seaweed fabric, are also fully reversible." "In this design I let the material speak to me, as it is the key element in the IOU Project's line. Madras is reversible, so taking it to the next level I wanted a garment with multiple uses that would inherently be sustainable without saying a word. 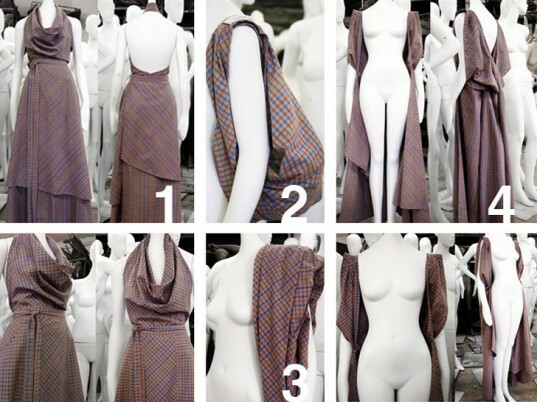 "The result is a reusable bag, a sundress, a beach blanket, and a long vest all on one, with each design transforming itself completely. 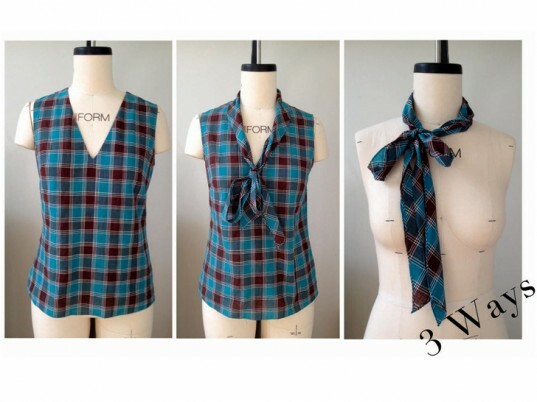 To save from making multiple patterns in multiple sizes for manufacturing, I wanted two patterns: S/M and L/XL. The bag, blanket, and vest were void of size so my concern was the sundress, as I had to make the garment fit almost any body type. I chose a cowl neck because of both its drape-like and expansive qualities, and an A-line skirt that ties in the back to fit and flatter almost any waist size." "My piece was initially inspired by Mr. S. Murugave's construction of the weave. The weight of the resulting raw fabric holds shape well and lent itself to a more structured design. Therefore, I wanted to create a flattering, tailored garment. To achieve this, I shaped the fabric to closely fit the body and employed a collar and lapel neckline. In order for it to be well-fitting, I played with many different arrangements of darts, eventuating in creating panels to have a tidier finish. "I pared back my design sensibilities in order to fit with IOU's look of highly wearable, classic garments. I wanted my garment to be easily worn by many, so steered it towards a sleek, simple, and most importantly, a versatile one for maximum usefulness and personal expression." "A flattering look, for tall, short, curvy, and skinny women alike, is a fitted bodice and full skirt. 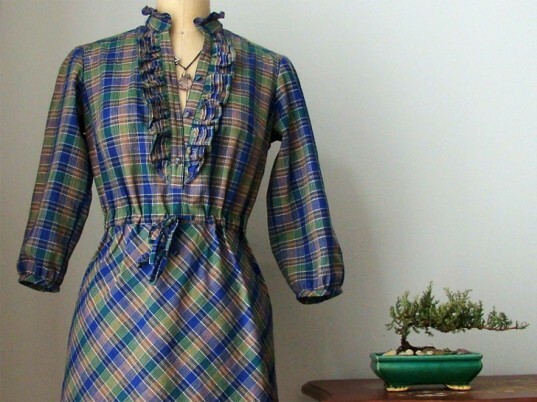 Very little says summer more than madras cotton, so I set out to make light and feminine dresses which could transition from a picnic in the park in flip-flops to dinner in colorful strappy heels. 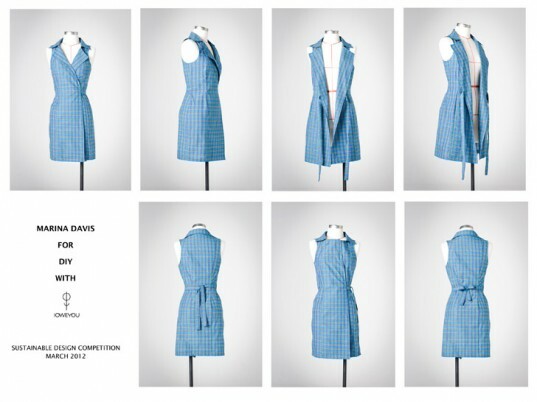 "Because the winning entry will be reproduced in a variety of madras fabrics, I wanted to be sure that the dresses would translate well in different colors, plaids and checks."